The end of 2011 was full of festivities. 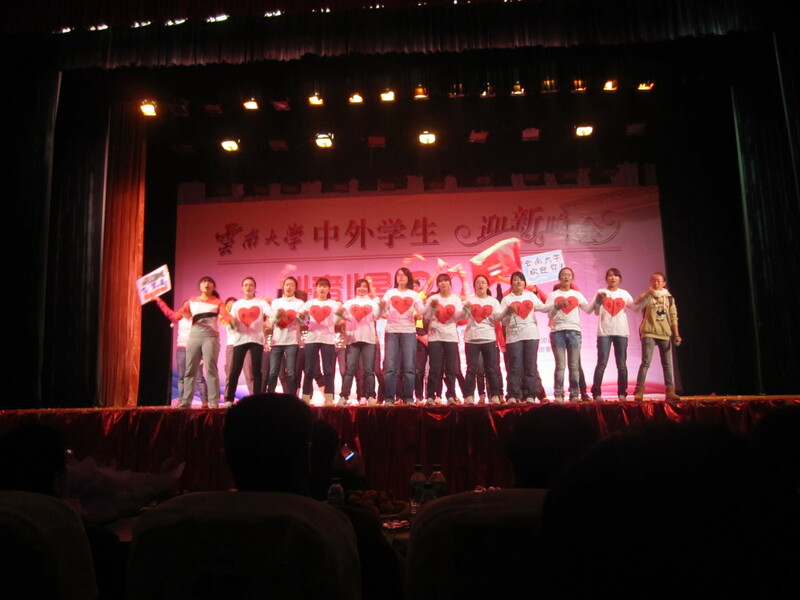 In mid-December I attended Yunnan University’s Christmas Gala, where foreign students studying Chinese, MBA candidates and some China-Canada Project students performed on a big stage to an audience of several hundred, including some head honchos from the university. Audience members were given light-saber-esque glow sticks and annoying plastic hand clappers upon entering the auditorium, which they used before, during and after every performance. I thought that “gala” meant “banquet” which meant food, but I unfortunately found out that was an incorrect assumption. My stomach grumbled while I tried to sit patiently through the three-hour long event. The hope of winning the iPad raffle prize kept me awake… Jess wrote a pretty good summary of the best performances on her blog. My favorite act-- MBA students doing a compilation of different famous dance moves. 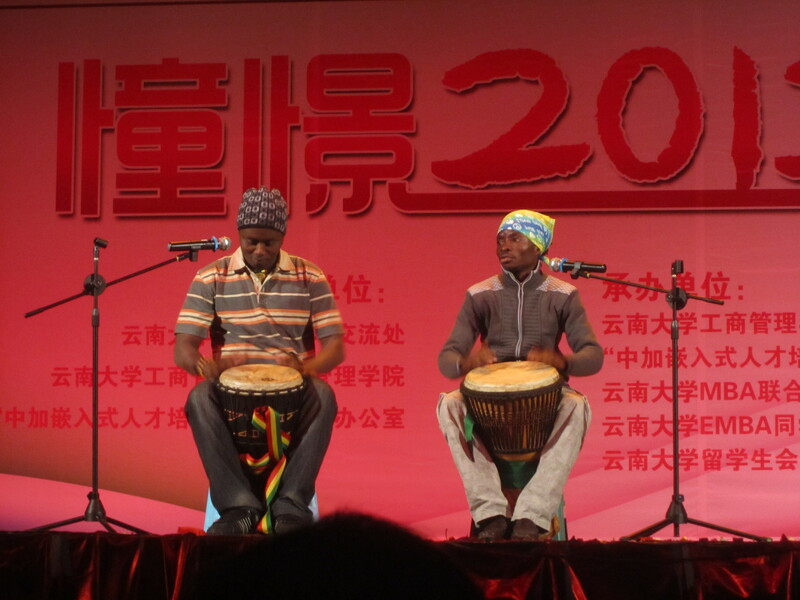 They weren't very talented dancers, but managed to keep straight faces and genuinely gave it their all. I was in stitches the whole time! 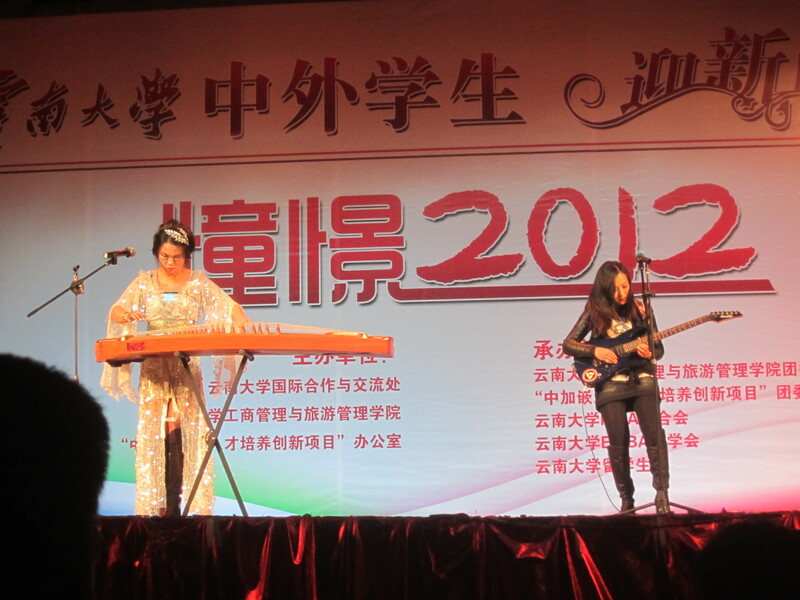 Fake performance of two women playing a traditional Chinese instrument and electric guitar. Neither one had an idea of what she was doing. Painful to watch! 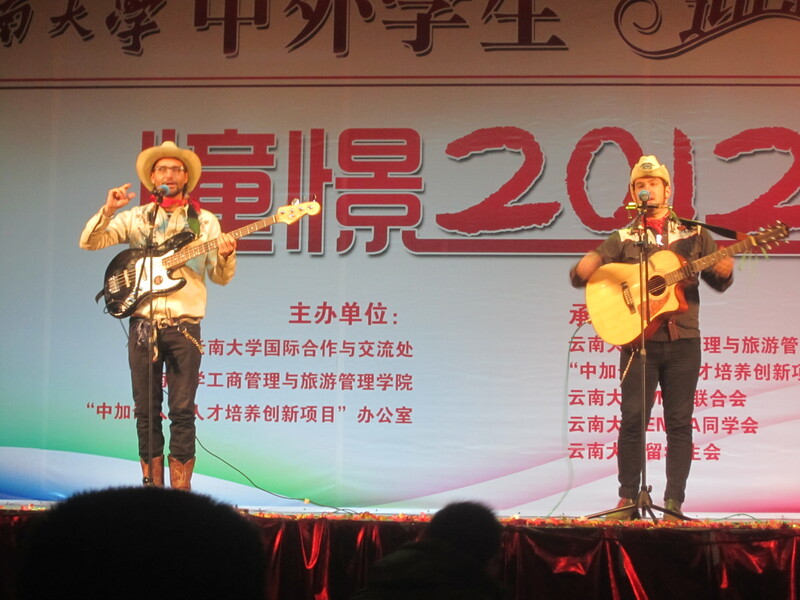 A week later, the China-Canada project had its own smaller holiday party which also featured a remarkable list of performances by students, as well as some endearingly awkward games. Apparently one of the foreign teachers last year set up a crepe station and made them during the party, so my students asked me to contribute some food. UM, BIG SHOES TO FILL! I knew I couldn’t top that act, but I thought it would be rude not to make anything. At the last second, I thought of the perfect treat– Muddy Buddies. You know, Chex cereal coated in melted chocolate and peanut butter, then covered in powdered sugar. I wanted to tell the students it was called “Reindeer Poop” but I settled for “Reindeer Food” instead. It was a hit! 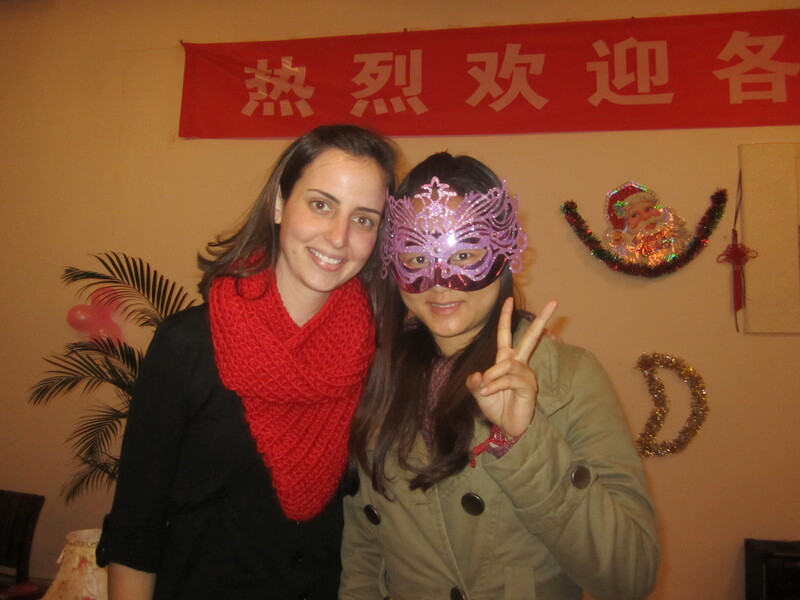 Everyone at the party was given pink, purple and green masks. I'm not sure why. Here I am with Anna, the secretary in the office. In the background you can see the ubiquitous Chinese Santa head wallhanging. 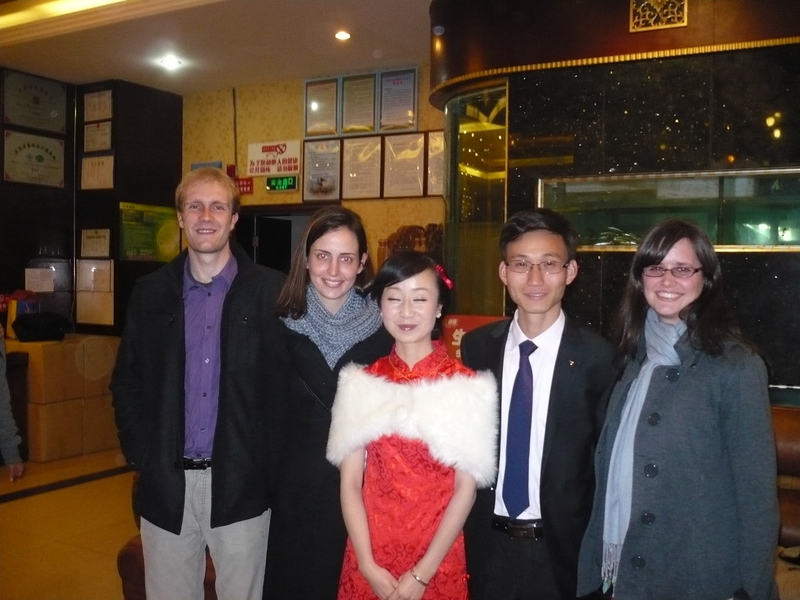 Then, approaching the new year, in the span of a week I was invited to two Chinese wedding banquets. I was super psyched, especially when the invitations came with a little red box filled with chocolates. Now that’s how to get people’s attention! Jess wrote a great post about the weddings, so I’ll just leave you with a few pictures. 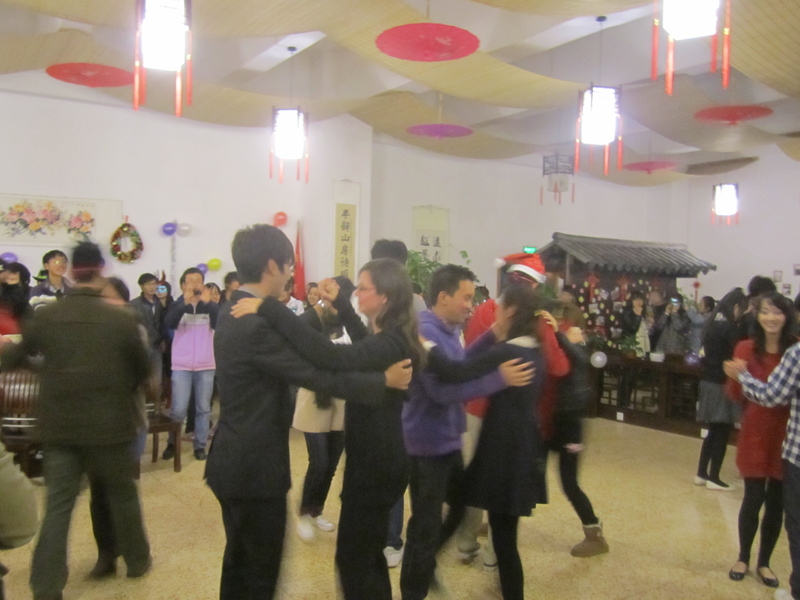 These were my first Chinese weddings, and from what other people were saying, it seems like they weren’t actually the formal wedding, but more like a preliminary party before the bride and groom seal the deal at an official ceremony in their hometown. 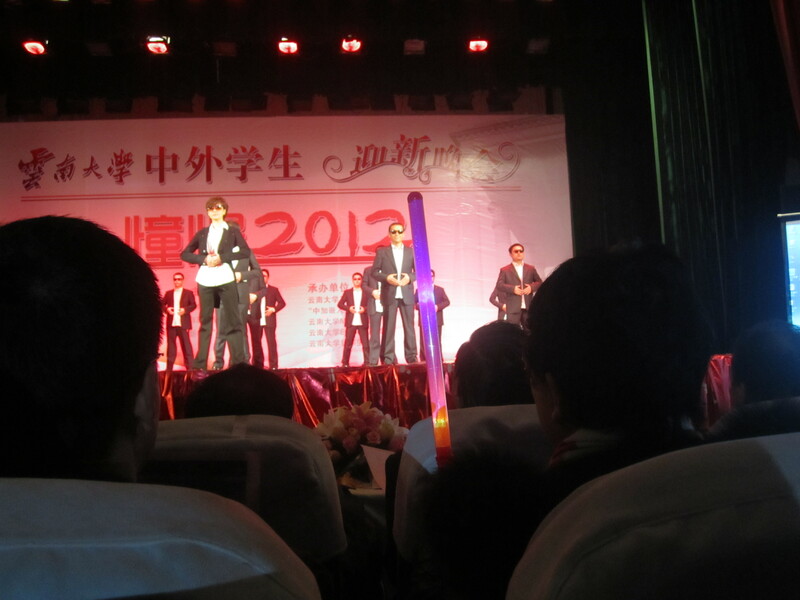 Nevertheless, it was fun to attend. 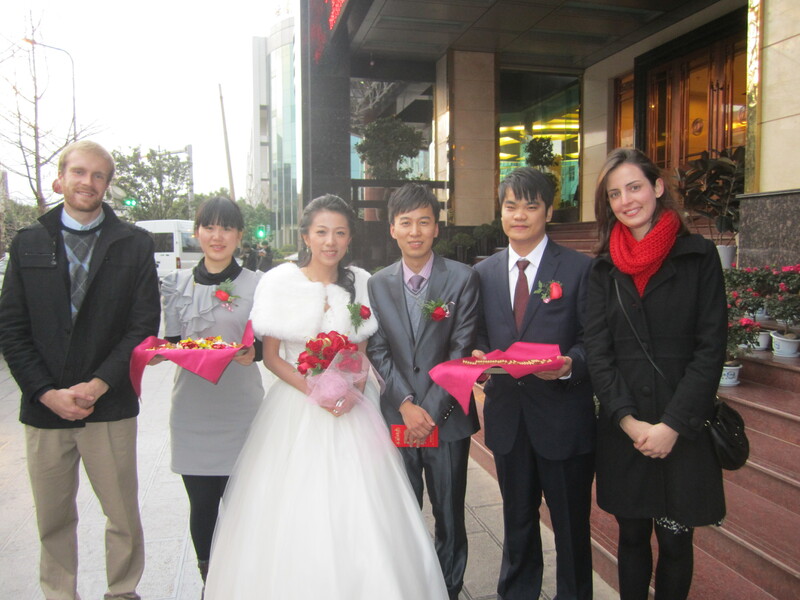 Outside wedding #1 after giving the groom the "hong bao 红包" (red envelope with money inside). No-nonsense wedding gift-giving! Overall, I had fun getting dressed up for the different events, stuffing my face with food and candy, and listening to many (too many) heartfelt, yet off-key, songs performed. Getting caught up on all of these which are all great. I know it is a small slice of life but still a really good one. Your tone is always so positive even when the sod cries. I am not sure if I would make your card with that one but I consider your assimilation is pretty good when attending a wedding (of sorts). Thanks Mark. Glad that you had time to read the blog in between tending to Finn and Maeve. Apparently the reason that so many people are getting married now is because they want to have a baby in the auspicious year of the dragon, which starts on January 23rd!